The community is able to make clean water by using hydro panels to draw in water vapor and then condense it into clean water. 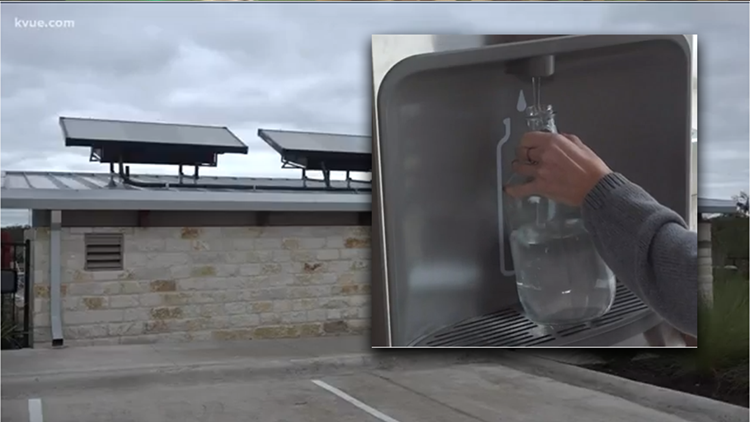 AUSTIN — As Austinites line up to pick up bottled water, an East Travis County community is using the sun and the air to make some of its own. The Whisper Valley community near FM 973 and South Highway 130 recently installed Zero Mass Water's SOURCE hydropanels at its clubhouse. They've come in handy under the City of Austin's boil water notice. "We've been bringing water bottles and water jugs straight out here to the hydro panels and refilling up with clean, potable water," Hme Owners Association Manager and Lifestyle Director Kara Weinstein told KVUE. Here's how the hydro panels work: They draw in the water vapor around them and the solar power and then condenses it into clean water. Each panel can produce about 3 to 5 liters -- roughly a gallon -- a day. "We then mineralize it with magnesium and calcium, and it's delivered right to a tap," Zero Mass Water's Head of Marking and Communications Kaitlyn Fitzgerald said. The panels even work in cloudy conditions. "We've been keeping an eye on it and the hydro panels at Whisper Valley are producing wonderfully despite the cloud cover," Fitzgerald said. Whisper Valley resident Mars Chapman has been taking advantage of the new feature. "Even though it's not right outside my front door, it's still been nice to have this source of water that is nearby, that is available," Chapman said. "The idea that you're literally pulling water out of the air is kind of fascinating." It's a better alternative to boiling water or a trip to the store and it keeps the year-old housing development ahead of the game. "It's just an added level of how we can provide a sustainable lifestyle here in Whisper Valley," Weinstein said. According to Fitzgerald, the panels can take about half a day to install. Each one can store away in its reservoir the equivalent of about 60 water bottles.